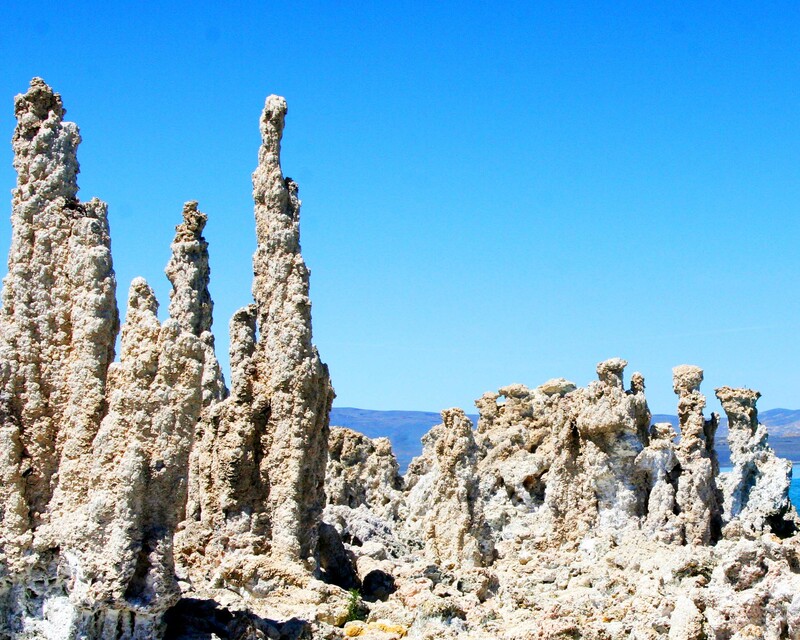 Towers made of lime known as tufa give Mono Lake its unique personality. To say the least, Mono Lake is a strange place. Some people even call it weird. Once upon a time, back when glaciers stretched across North America, it was part of a series of large lakes that covered much of modern-day Eastern California, Nevada and Utah, a region that is now primarily desert. Left behind as a remnant by retreating glaciers, Mono Lake is at least 760,000 years old and could be as old as three million years, making it one of the oldest lakes in North America. 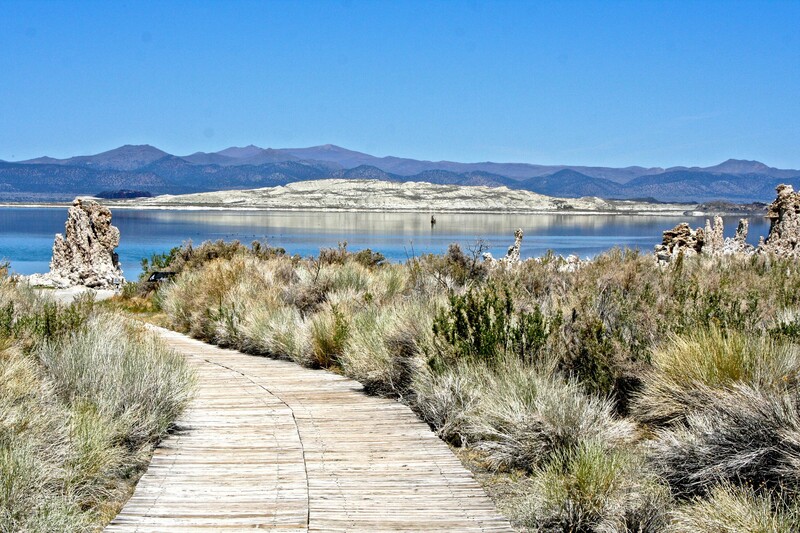 What flows into Mono Lake, stays. There are no outlets. As a result, the lake is 2-3 times as salty as the ocean. Swimmers don’t have to worry about sinking. In fact the lake contains some 280 million tons of dissolved salts, which makes it even too salty for fish. An effort to introduce trout left them belly up on the surface, like the proverbial dead gold-fish destined for a close encounter with the family toilet. Algae, brine shrimp, and alkali flies thrive in the water, however. The thumbnail-sized shrimp population is estimated to be somewhere between 4 and 6 trillion in the summer. Historically, the fly pupae served as a major source of food for the Kutzadika’a Indians. In fact, the name for the tribe means fly eater. Today, both the flies and shrimp provide food for some two million birds that migrate through the area. One visitor, Wilson’s Phalarope, a tiny, fist-sized shorebird, takes advantage of the gourmet flies to double its weight and grow a new set of feathers before journeying 3000 miles to South America— a feat that is accomplished in three days of nonstop flying at speeds of over 40 miles per hour. 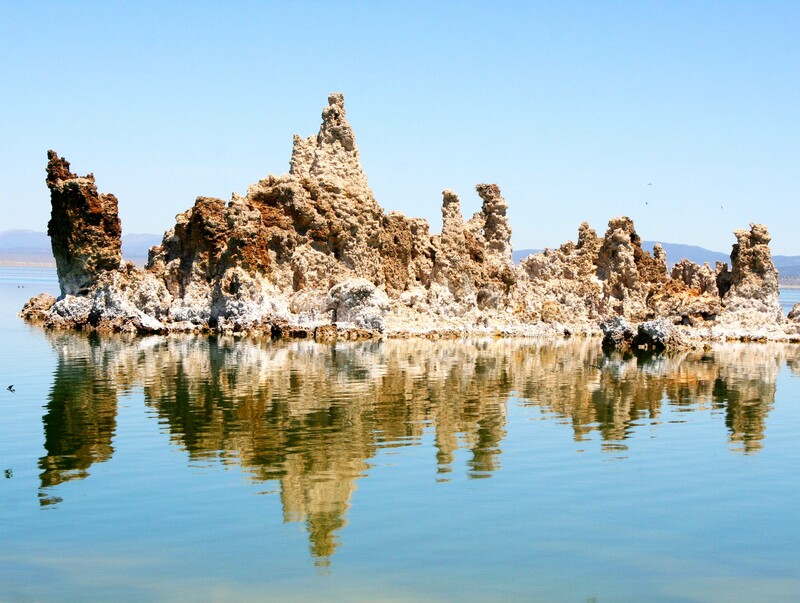 It isn’t flies, shrimp, birds, or salt water that Mono Lake is famous for, however. 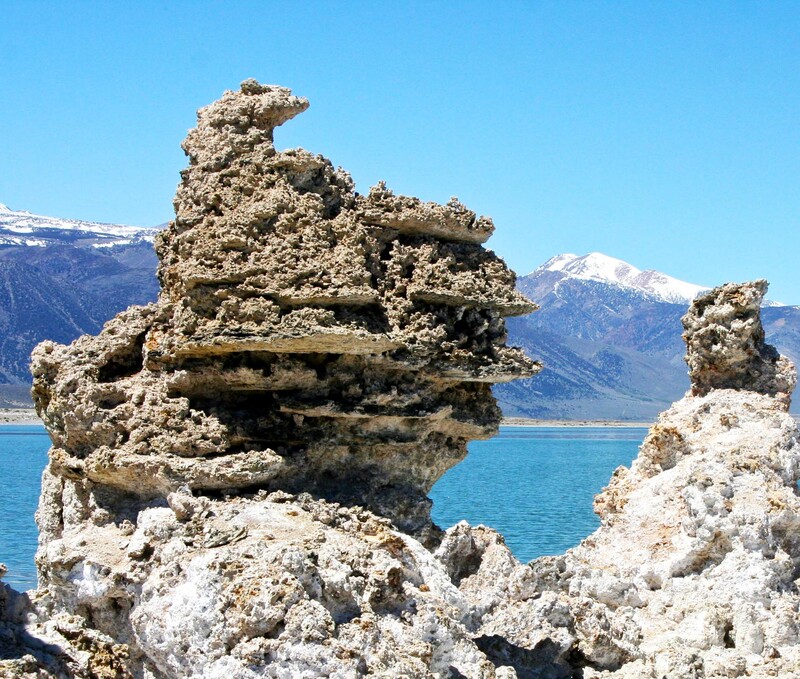 It’s tufa, the fantastical, fairy-like structures that grow in the lake and appeal to photographers from around the world. Calcium-rich water bubbling up from underwater springs combines with the lakes carbonate-rich waters in a chemical reaction to create the lime-based structures. Towers as high as 30 feet can be built under water through this process in a time span that may involve centuries. The reason these towers are visible today is due to the unquenchable thirst of millions of people in Los Angeles. 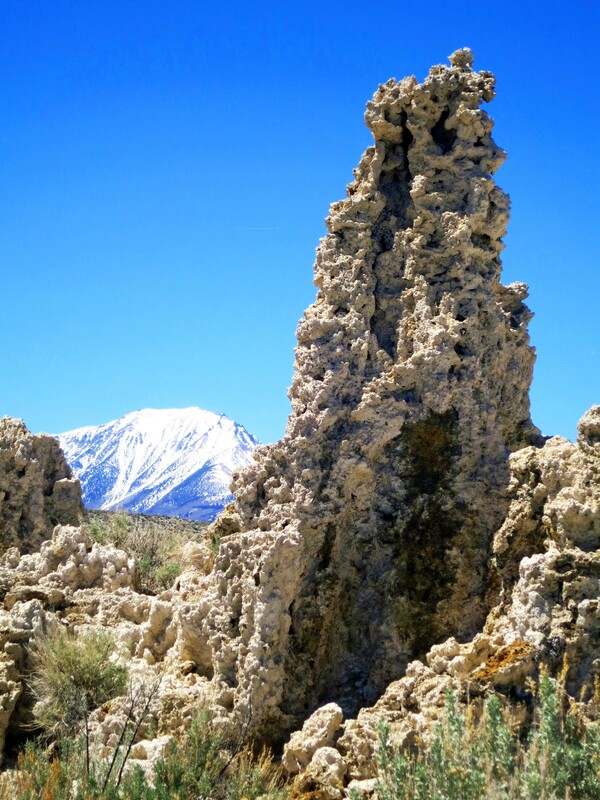 This thirst came close to destroying Mono Lake, as it did the Owens River and Owens Valley south of Mono Lake. 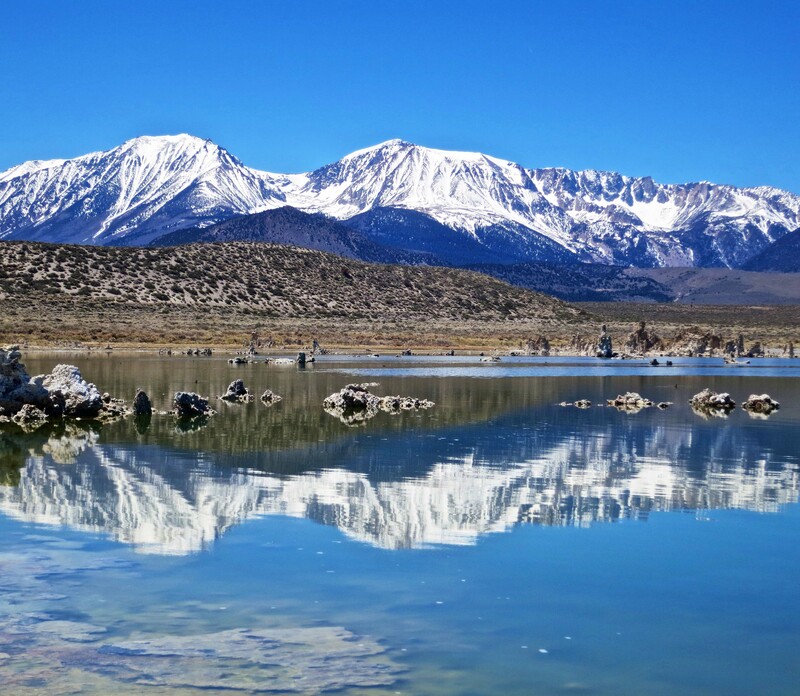 Starting in 1941 the politically formidable Los Angeles Water and Power Company tapped into the streams flowing into Mono Lake and sent the water on a one-way, 330 mile journey south, reducing water in the lake from 4.3 million acre feet in 1941 to 2.1 million acre feet in 1982. The United States Navy also posed a threat to Mono Lake by carrying out a series of under water explosion tests during the Cold War. The plaque at the site described these explosions as top-secret seismic tests. Whether the navy was searching for a way to predict earthquakes and tsunamis or cause them is the question. Fortunately, public pressure and concerns for public safety led to the navy abandoning its activities at Mono Lake in the late 50s/early 60s. 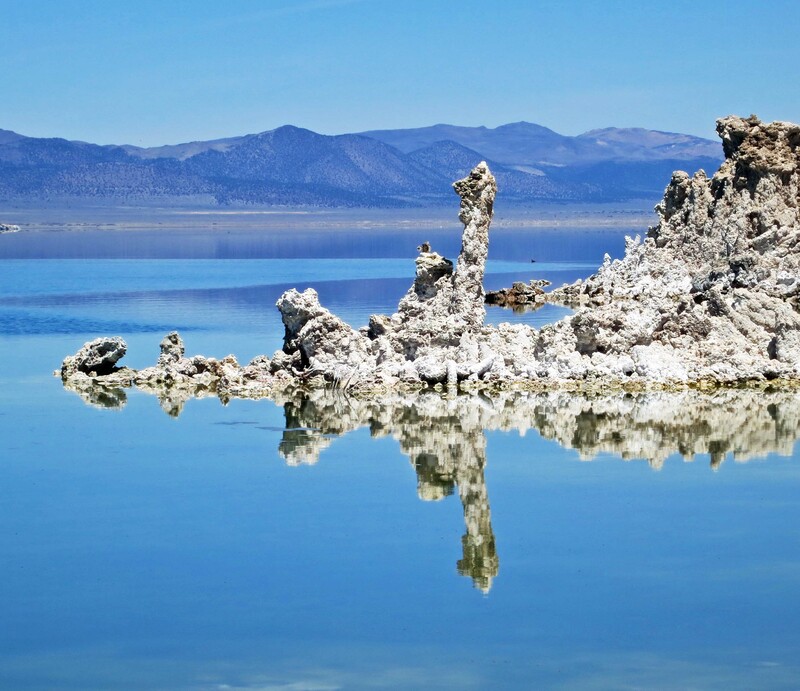 It was the growing environmental movement of the 70s and the Mono Lake Organization that eventually forced the Los Angeles Power and Water Company to reduce the amount of water it was exporting from Mono Lake’s tributaries. Today the lake is on the way to recovering its pre 1941 water levels (assuming it isn’t wiped out by global warming and drought). 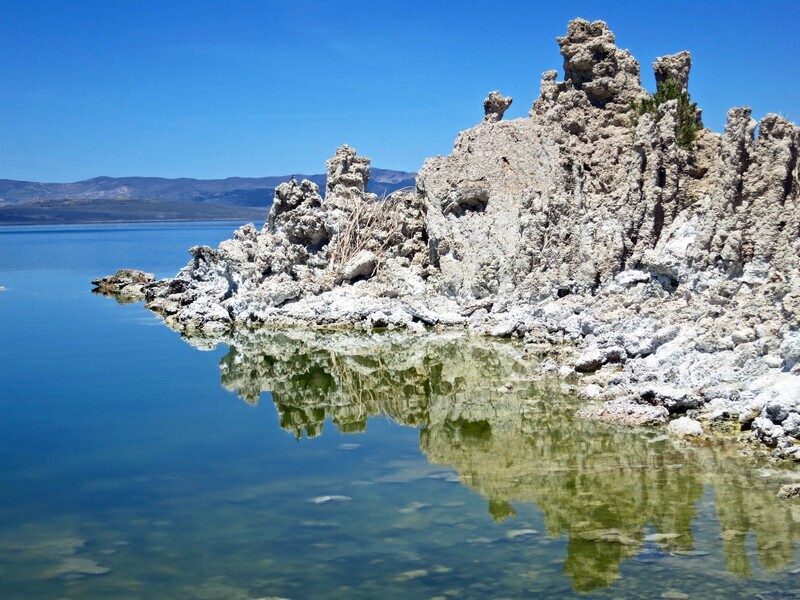 Mono Lake is found just north of Lee Vining off of Highway 395. Following Highway 120 west out of Lee Vining will take travelers into Yosemite National Park. 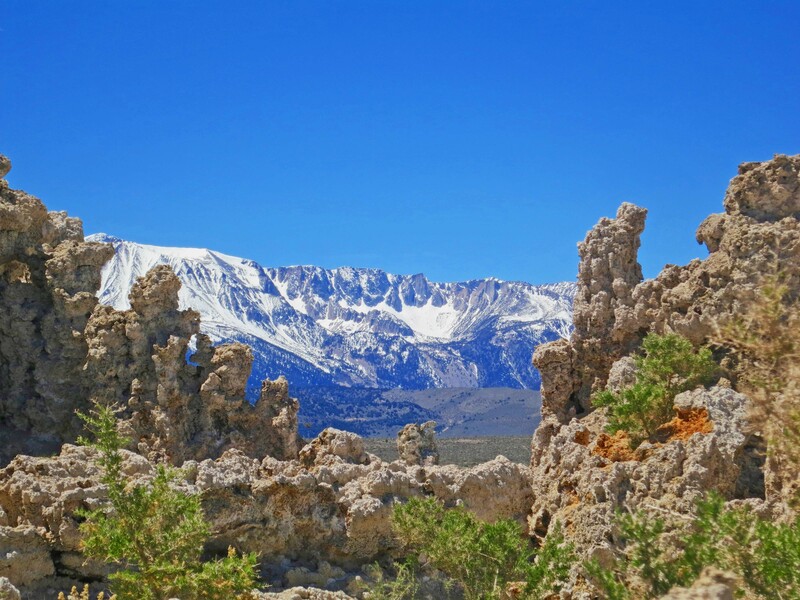 The Sierra Nevada Mountains provide a scenic backdrop in the west for Mono Lake. Highway 395 runs along the base of the foothills. Tufa can be seen emerging from the lake. 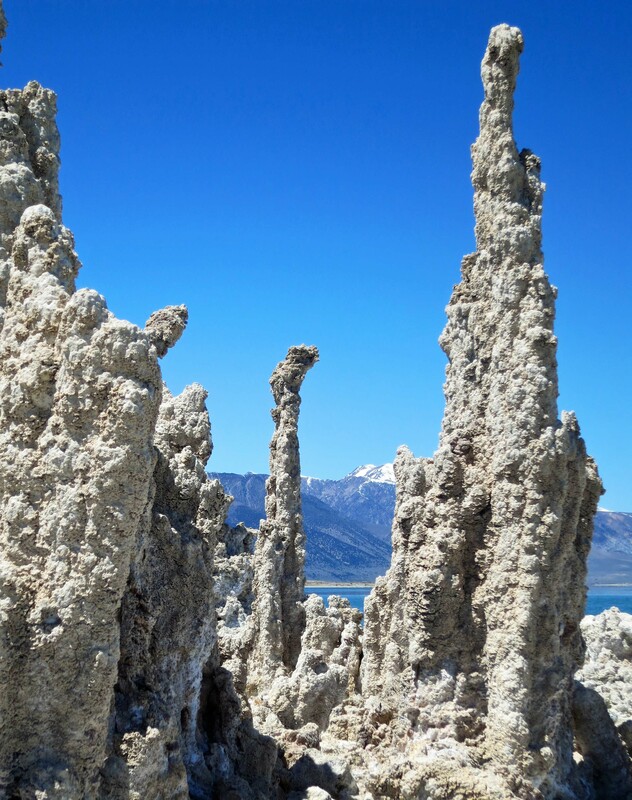 Prior to Los Angeles tapping into the streams that provide water to Mono Lake, this tufa tower would have been underwater. Now it sits on dry land. A final view of the Sierra Nevada Mountains framed by tufa towers at Mono Lake. NEXT BLOG: Having finished our desert series, Peggy and I return to Oregon and visit Oregon Caves National Monument.